an international team looked at the seasonal growth rings in 28 specimens of 500 centuries old Fitzroya cupressoides , a conifer found in South America to trace a picture of the world's climate 50,000 years ago. The scientists were able to study the trees as a result of two natural disasters. The first covered up and preserved the trees around 500 centuries ago. The second, in 1960, began to bring the trees back to the surface. They found what seems to be early evidence of El Nio, the largest single source of modern weather variation, caused by a cyclical movement of warm waters in the Pacific. The trees, found in Pelluco in southern Chile, provide an unprecedented weather record dating back 50,000 years ago. "What it has done is give us a first glimpse of year-by-year records for the period," explains Keith Briffa, researcher at the University of East Anglia, uk . 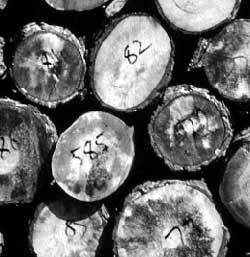 By studying the annual growth spurts in the tree rings, scientists can get an idea of the seasonal conditions that existed year on year through a tree's life, such as how warm it might have been and the amount of moisture that might have been in the soil. Well-preserved or fossilised trees have been found before in Tasmania and Siberia, but they were only about 10,000 years old -- much younger than the Chilean samples. The data will be more significant once they can be linked to other evidence of ancient climate variation -- what scientists refer to as proxy data. "At present, most of our information comes from oxygen isotopes in ice cores in Greenland and studies have been done tying this in with ocean sediments," says Briffa. This new source was a chance find.